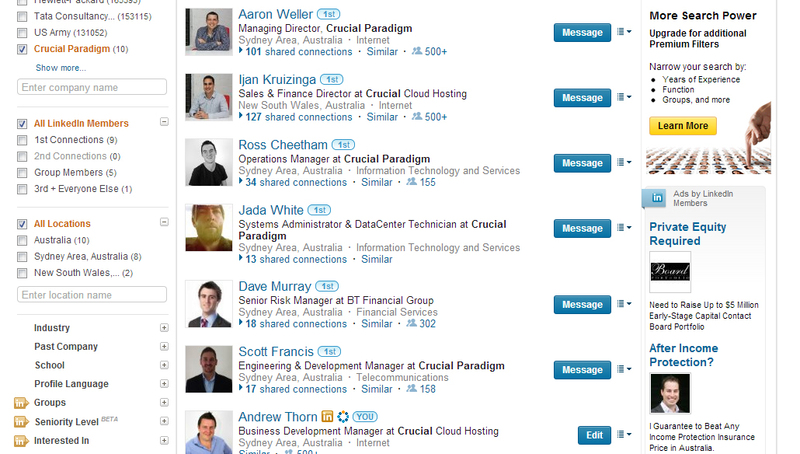 LinkedIn has changed the way we network, In my role I use LinkedIn on a daily basis (sometimes hourly). During all this time using LinkedIn I see a lot of profiles both Personal and company and one thing I notice is that some people seem to know the importance of a great linked in Profile and some people are probably just there to have a presence and do not realise the benefits LinkedIn can bring their businesses. I thought it would be a great time to share my tips for a killer LinkedIn Personal and company profile. The number one thing with your profile should be making sure it is complete. The more complete your profile the more information there is for people to search. Your profile is indexed in a similar way to Google Your skills, job experience, connections and interests are used when LinkedIn associates you with other users, it will suggest contacts for you to engage with and also helps potential customers find you when they are doing a search. If you want to see an example of how you can be found using keywords login to LinkedIn and click on the right hand side of the page where it says “WHO’S VIEWED YOUR PROFILE”. Here you will see who has viewed your profile in the last few days ( potentially even weeks depending on whether you are a paid user or not). You will also see on the right hand side the “top search keywords” that have brought people to your profile. In my example I can see the keywords “Andrew Thorn, Business Development , cloud business development and guerilla business school”. You will notice the first keyword is my name, the second one is my job title, the third is my industry ( cloud Hosting) and the last is a course I had done. So you can see there are alot of ways people can find you on LinkedIn so it pays to have a full complete profile. Your Business Needs to be on LinkedIn and below I will show you some of the best ways you can get your business featured as prominatly as your Personal Profile. 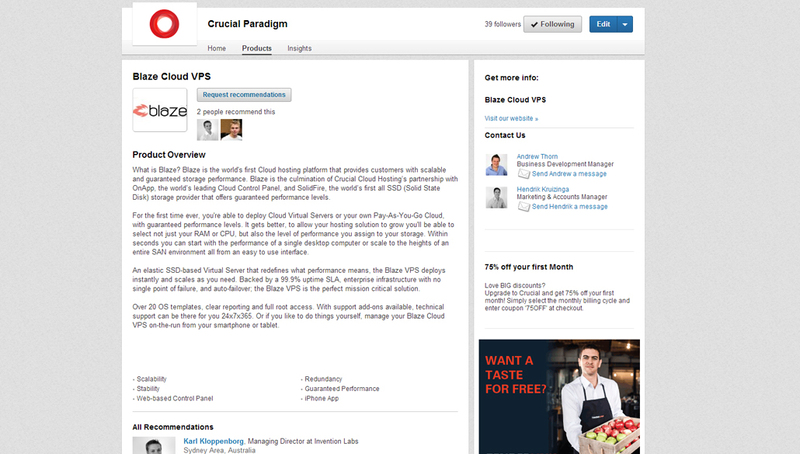 I am going to use own our Linkedin profile here at Crucial. Linkedin lets you brand the homepage of your page with a banner that is 815px by 315px. You can use it to really lift your page. I have added ours below as you can see we have a big logo and some tiles of our main products and pricepoints. 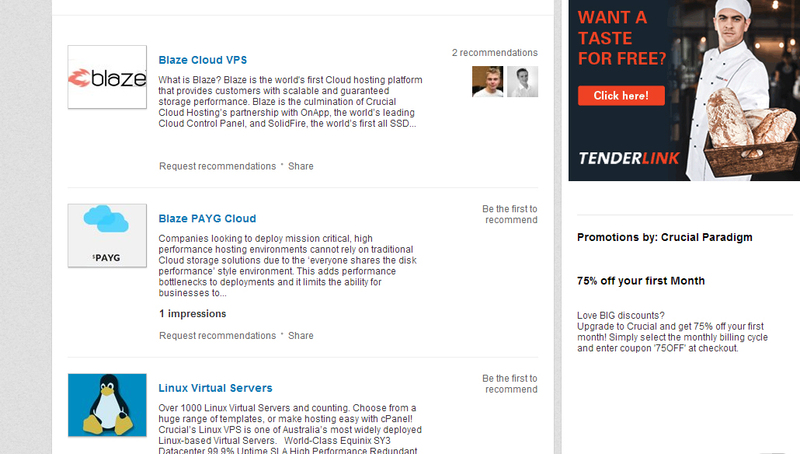 Alot of people do not use this and I dont know why, Linkedin lets you add 3 images to your Products and services page. These images are a slideshow which you can click the little arrow at the top to slide through the images. You can use these images to showcase your products and really get some great exposure. 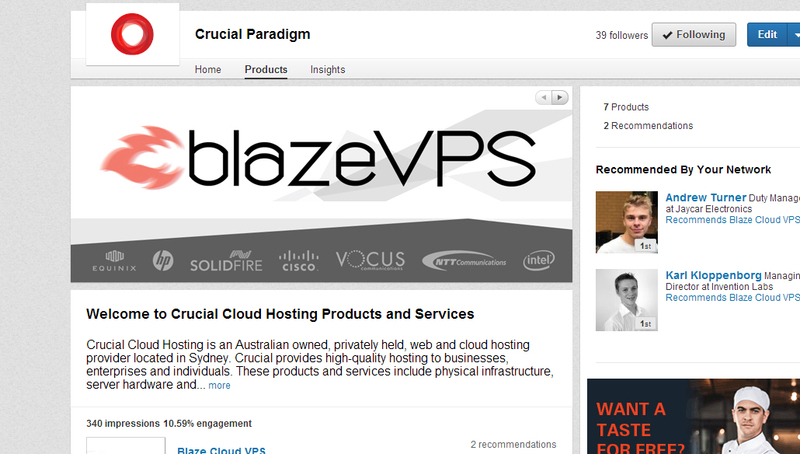 I have included an example of ours below for our Product the Blaze Cloud VPS. You need to make sure that you list all your products and services, the more products and services you have listed here the more searches you will turn up in. You have the ability to put a small image and and a blurb about your product. If you click on the products below you will open up into a product detail page. You can enter alot of information in the product detail page. You need to make sure you enter all the products and features and also provide a clear and detailed product description. Try and use as many keywords for your products as you can without sounding weird. You can also assign some of your sales team to the product to be contacted if a visitor has an enquiry. There is also the ability to create a promotion which can be unique for Linkedin visitors. This promotion is great as you can really engage people and give them something special for viewing your profile on LinkedIn. This point really is very import, you need to have your staff listed under your company profile. In my experience it is very strange if a large company does not have a majority of its staff listed on LinkedIn. I know companies use LinkedIn to assess the experience of the staff before choosing to become a client. Our clients have told me they have checked the experience of our senior managers before choosing to come with us. So you need to make sure that the key staff are listed and they have full and complete profiles. There is no better way to sell than through word of mouth refferals. On Linkedin these refferals come in the way of Product Recommendations. You can ask your clients to recommend your products you have created and have there recommendation listed against that product. This is what we call Social selling and leads to very high rates of conversions. We have just launched all new products on LinkedIn and we are currently asking our current clients to recommend the products we offer. You should actively invite your clients to recommend your products. This will see the highest conversions on any one of these tips. Here are crucial we love writing blogs on a variety of topics ( such as this great article) , what better way to share them with your audience then via your LinkedIn page. 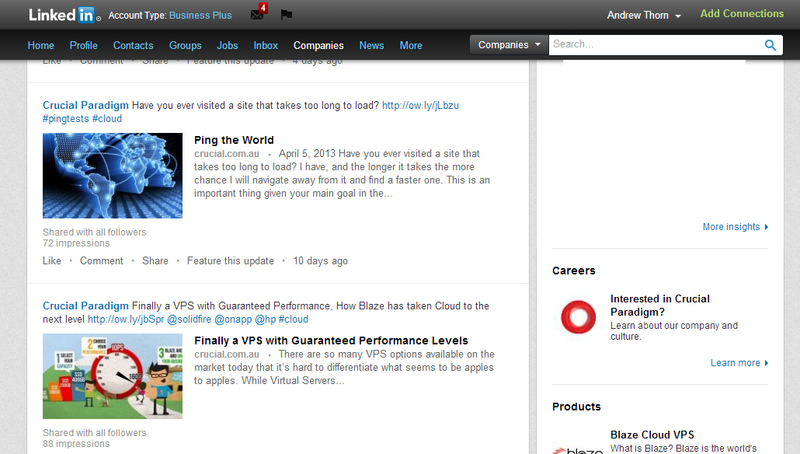 Here LinkedIn lets you post your blog articles which link directly back to your site. You need to make sure you include a photo in your blog article so that people can see at a glance what the article is about. Make sure you check back often and see what posts have had the highest engagement. This can help you find out what topics to write about in the future. LinkedIn provides some great reporting about your visitors to your page and also what industry they are in. You can also see the insights into your products and services as well. 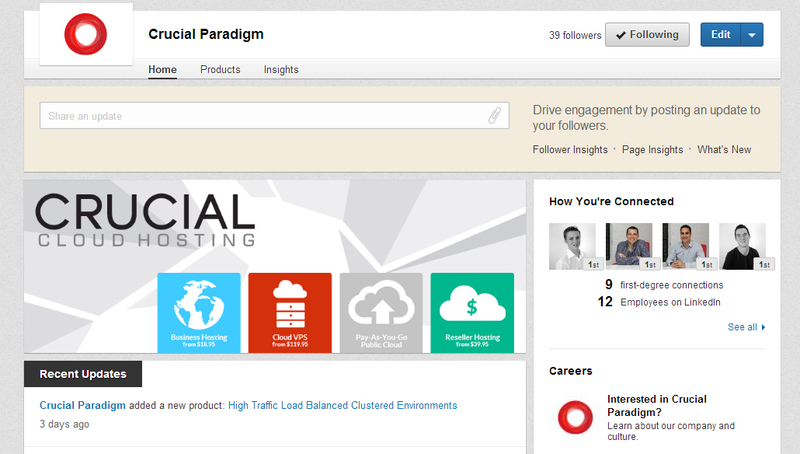 This is a really good area to optimise your Linkedin Page as you can see very easily what is working and what is not. I hope this article has helped you refine your LinkedIn Pages. LinkedIn has produced some great content to help you with your pages, I have linked to the resources below. Please link me to your LinkedIn pages in the comments so we can all see what great pages you have!